“You train the taijiquan, relaxation and so on first of all. After training in the form you then look at training with other people like in push hands. Everyone’s got their own different situation, their own method of training. The first step is to train the body to be soft and relaxed, you get the qi going to the dantian and circulation working properly and so on. In Chen style, push has different stages, fixed step and moving step and they are all designed to show different parts of the skill. The first skill is called wrist power – sticking hands, and you are just trying to do circular movements and stick to the other person’s movements. In this exercise you don’t have fa-jing, you just listen and follow and try to develop good contact. 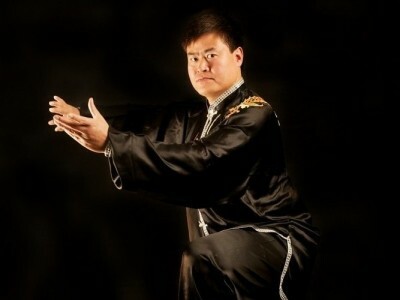 The second stage is fixed step using peng, lu, ji and an and this trains these four techniques, making sure you do them correctly, following the same directions, not doing it off to the side, leaning back or forwards or sideways, but always following the guidelines for the technique. The body shouldn’t lean to the side but there is a quite precise way you should do them. The third stage is moving step. This stage you both do the same posture and try to make sure that no force is used against each other, just going through the routine and going through the postures. You are trying to find out whether your partner is doing the right technique at the right time. If the technique of your partner is out of line, poor body alignment or whatever, then you can use that force of your opponent to move him. At this stage you are trying to find the other person’s faults and mistakes; you don’t create confrontational strength against each other but through the following, listening and moving steps you are trying to identify opportunities. To avoid any confrontation against each other in force you learn to neutralise if there is any potential or intention of incoming force. The next stage is called dalu – a very long stance, training for your roots and stamina and co-ordination between the roots and the waist so you can go up and down also practice the exertion of power from the hip and waist. When you do partner work, usually things happen because one party is too strong and wants to dominate. You must do a role, separate, with one leads one follows; one listens one moves. You must co-ordinate and be considerate of your partner and to avoid any strength against strength – you must agree between partners the role definition. The biggest problem is that people come to tui shou for health purposes so they come once a week. They get stronger one day out of seven and they go back after 7 days they’ve lost the work out and have to start again. This is the main problem if you want to do tui shou to increase the strength in your limbs etc you need to do 2-3 times at least.